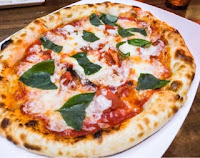 When I think about Pastizza, thoughts of delicious pizzas and an impressive bomba come to mind. Their funky name was whimsical and aptly describes the restaurant’s menu. It has since been re-branded as Cresta, to better showcase the restaurant’s focus of bringing California wines to Toronto (Cresta Ridge is where the owner’s winery is located). Otherwise, management and Chef Tri Tran remains. Their menu has changed, evolving from one predominantly comprised of starches to include more starters and mains. 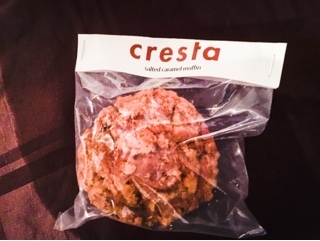 Cresta's menu has trended towards upscale mains such as lobster spaghetti, seared scallops, and rich meats. 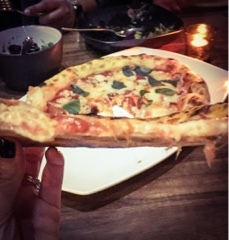 Yet it's good to see less pricey items such as delicious pizzas and sharing plates are still offered. 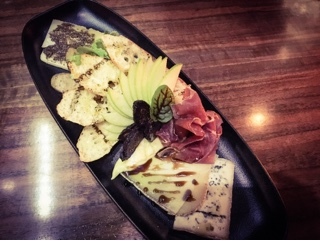 The appetizers are great for sharing, the salumi ($15) a combination of charcuterie, cheeses, and fruits. Aside from a mild blue cheese, ultra creamy brie, and prosciutto, there are unique additions including a flavourful foie gras sausage and a firmer cheese topped with spicy truffle paste. Marinated in harissa, a roasted red chili paste, the grilled octopus ($15) had a fair amount of smokiness and heat. 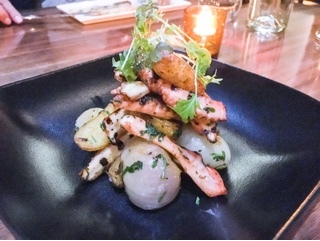 With plenty of pieces of seafood, the dish could even work as a light main given it’s accompanied with fingerling potatoes and braised cipollini onions. Although the octopus was tender, cooking it a touch less would help retain more of its juices. Cresta's pizzas are tasty as ever: the thin even crust wispy yet has a crispy base to resist sagging. The outer edges left thicker to remain chewy and act as the perfect vessel for dipping into chili oils (not immediately brought to the table but is available upon request). The margherita ($18) is simple - topped with fresh plump tomatoes, plenty of fior di latte, fresh basil and a light dusting of parmesan – yet has a well-rounded taste and allows diners to enjoy each ingredient. On the other hand, the prosciutto cotto ($22) is intensely flavoured on account of the pungent gorgonzola, generous layer of salty prosciutto, chili and woodsy mushrooms. 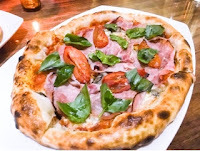 While I could easily eat an entire portion of the margherita, the prosciutto cotto is best enjoyed by sharing. 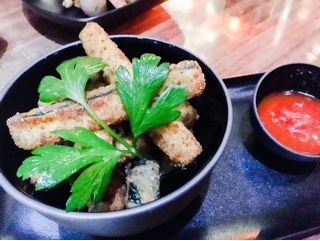 Vegetarians can rejoice, Cresta has a selection of hearty meat-free dishes! The crispy zucchini ($9) is wonderful for nibbling, coated in seasoned cheesy bread crumbs but still juicy due to the squash. 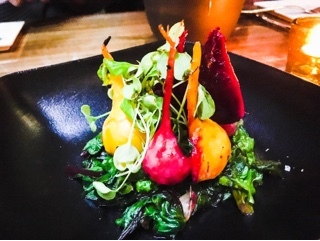 The vibrant roasted heirloom beets ($9) could easily work as a salad, sitting on a bed of sautéed greens with a light lemon thyme dressing that subtly contrasts against the sweet beets. 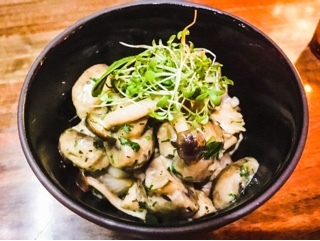 To go with the steak or lamb, the mushroom and onions ($11) would be a decent side, tossed in a light creamy sauce with the sweet mild cipollini onions balancing the meatier mushrooms. Yet it’s the brussel sprouts ($10) that were the most impressive. 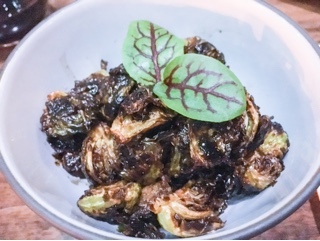 Our server explained they’re quickly blanched in garlic oil, giving the sprouts a crispiness reminiscent of roasting but keeps the center firm, while infusing the vegetable with a lovely garlic essence. Tossed in a sweet balsamic glaze, it's delicious and would be fantastic on pizza (with pancetta and parmesan) or even tossed into pasta. Finishing off with an artfully presented house made gelato, the orbs of ultra-cold creamy salted caramel, French vanilla and chocolate gelato were rich and delicious. 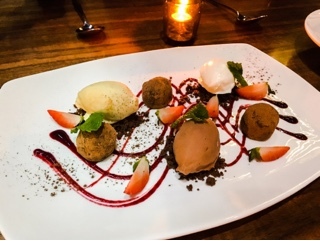 As if it weren’t enough, two decadent truffles adorn the plate, so creamy they’re best eaten with a spoon. 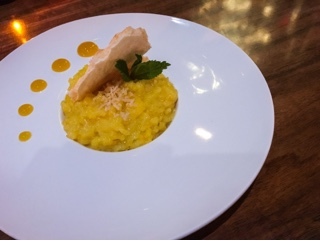 Normally not a fan of coconut, the warm rice pudding would be worth ordering again, the coconut’s sweetness combined with saffron gave the dessert a lovely aroma and a sweet & savoury quality. Cresta’s food is of course made for pairing with wine - I tried a robust 2013 Noble Tree cabernet sauvignon ($14) that paired nicely with the acidness from the tomatoes and vegetables. Yet, the restaurant’s cocktails are great for starting and ending the meal. A boozy walk through an orchard ($13) having the fruity essence from the apple cider, but made richer from the dark horse rye and bitters mixed throughout. 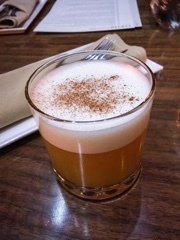 Since the nutmeg is sprinkled on top of the foamy egg whites, it reaches the nose releasing a lovely scent with each sip. 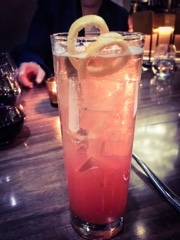 Although the Islay holiday ($14) sounds like it’s a “hair on your chest” drink, comprised of Tromba tequila and Bowmore scotch, it’s surprisingly refreshing due to the grapefruit juice. I dare say it’s even an easy going drink. A muffin to go is the restaurant’s last parting gift; the salted caramel chocked full of walnuts mixed into a cinnamon laced batter and finished with a salty crumble. 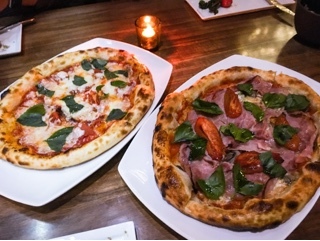 Located on a quiet corner by the St. Lawrence Market, wine aficionados need to venture south of Front for Cresta’s Californian Italian experience. Disclaimer: The above food items were provided on a complimentary basis. Rest assured, as noted in the mission statement, I will always provide my honest opinion.